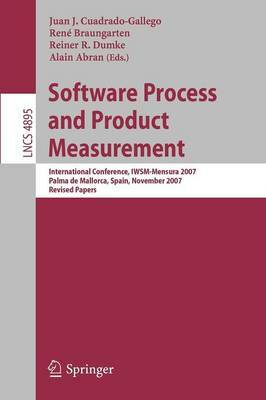 This book constitutes the thoroughly refereed post-proceedings of the International Workshop on Software Measurement, IWSM-Mensura 2007, held in Palma de Mallorca, Spain, in November 2007. The 16 revised full papers presented were carefully reviewed and selected for inclusion in the book. The papers deal with aspects of software measurement like function-points measurement, effort and cost estimates, prediction, industrial experiences in software measurement, planning and implementing measurement, measurement-based software process improvement, best practices in software measurement, usability and user interaction measurement, measurement of open source projects, teaching and learning software measurement as well as new trends and ontologies for software measurement.